I think I have a good idea. I have an ulterior motive for giving it, but I think it's a good idea just the same. Below the "Land of FAQ" area, there was recently a box giving a notice about the XYZZY Awards winners. I was just thinking, wouldn't it be cool if that box were there year-round, with its contents changing based on current events of the IF community? My ulterior motive is that I'd like people to be aware of my Spring Thing competition, which is going on right now. But there are also other things to announce... IntroComp is coming up, LoTech Comp is coming up, just to give a couple of comp examples. My thought is that that box need not contain big text. If the text were smaller, it could more easily contain announcements about more than one current event, whenever appropriate. July 30, 2012: Deadline for submission of intents. November 22, 2012: Deadline for entries. i've been creating individual pages on en.wikipedia.org for all the XYZZY "Best Game" winners  and all the IFComp winners  down the years. they pass wikipedia notability requirements by virtue of winning the 2 biggest prizes in IF. but they're just stubs so wondering if they could be expanded somehow? I can't really advise you very well about expanding Wikipedia articles. Wikipedia is a bit out of my league and I have no experience editing articles there. I would first study other (non-IF) game articles on Wikipedia for ideas on what sort of info they like and try to do the comparable stuff for the IF articles. Since Wikipedia likes citations and doesn't like "weasel words", you'll probably want to back up any assertions with links to reviews or r*if threards about the games, I think. If you're merely asking for manpower to edit those articles, well, personally, I'll have to decline. I've got enough on my plate with this wiki right here. Yes, the main page is made from the Main Page templates. I don't really know if people are welcome to edit those templates (I'm not an IFWiki administrator). But I did edit one or two of them and nobody complained. In particular, I think it can't hurt if we make the Competition News template as up-to-date as we can. But the others should probably be left alone... although, once, I couldn't resist adding a shameless self-advertisement to the Feature article, but at least it was definitely on-topic. I think the comments on the Talk pages tend to be forgotten when they aren't answered quickly enough (i.e. before they're no longer in the Recent changes page). There are lists of all the Talk pages, including the old ones, in All pages (Talk namespace) and similar pages, but they're not very readable, because they also list all the comments which were answered. I suggest that we could create a page with an index of all the Talk pages (or sections from Talk pages) which still need answers, and another index of all the Talk pages which were satisfyingly answered (or didn't really need an answer). Very general non-spoilery synopses (ala the "About the Story" at IFDB) can go near the top of a game page, just under the genre icons. I should edit the style page to show that's permitted. However, a full spoilery synopsis belongs on a spoiler page. Spoilers are mostly something we haven't got around to yet. And yes, they should go on a separate spoiler page, e.g: "The Gostak/Spoilers" and put in the Spoilers category. I've been wanting to make, for example, a "Worlds Apart/Spoilers" page with all the vocabulary in it, and a Who's Who or Dramatis Personae for various other games for quite some time, but, well, I just haven't done it yet. Look how many games don't even have pages yet, or don't even have "How It Begins" yet. The IFWiki contains many many links to other websites, and that's a good thing. But inevitably, some of them become dead links sooner or later, and that's a problem. In general, when I find dead links, I try to fix them (with the new address or a link to the Internet Archive, if possible). But I'm sure we miss many other dead links: we can't manually check every single link from every single page regularly! IFWiki:Dead links is a good page name. There seem to be many such tools available on the web; I've found several with Google, at least. But most of them were for websites in general, not particularly for wikis, and I don't know if they were appropriate for a really big site like IFWiki. But the link I've found which looked the most interesting is there. Apparently, a bot had searched for dead links on that wiki and automatically mentioned them on the Talk Pages; and it even mentioned the relevant Internet archive links! This bot seems to use Python wikipedia robot framework. When you make a new external link, you have to type in a Catchpa to show that you are not a spam bot. Even if you are a registered user; even if you have been a registered user for years; even if you have already done the Catchpa test 27 times that day. This is, of course, supremely irritating, and if something can be done about it I would be delighted. 1. Since the "Current Events" category is not current, would it make sense to remove the "Current Events" link from the "navigation" box on the sidebar? 2. Since Games have now been changed to Works, should the "Games" link in the "categories" box in the sidebar be replaced with "Works"? As it is, if you click on it, you get the page that says Games has been changed to Works, instead of getting to the actual works, which is probably what you want. 1. I'm wondering if there's any way to automate or simplify Current Events to make it easier to keep up? I'm not sure if it's considered important to keep a record of past events, or only to make sure the current news is displayed (deleting info that is out of date) as in the "Comp News" template. And I'm not sure what information is considered important to list. It looks like in the past, things like new issues of SPAG, new game releases, and Competition announcements were included--has anything changed in that regard? April 3, 3016 - XYZZY winners announced! May 16, 3016 - SPAG #347 is out! Another idea would be to set up actual feeds instead of a faux-feed. I've seen some sites automatically show recent links from Planet IF, (for example, Emily Short's blog <https://emshort.wordpress.com>, on the sidebar) so there's presumably a way to do that here. There could also be a feed for recently added entries to IFDB. 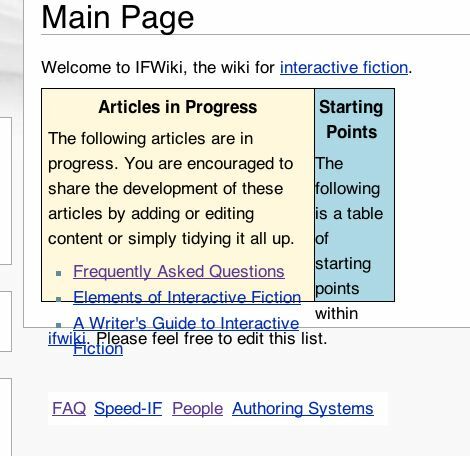 I don't know if this is what IFWiki really would like to see, and there'd be no history of the feed items on IFWiki itself, but an advantage would be that once it was set up, it would require almost no upkeep. Ok, I had another idea. What about this format for a "faux feed" of Current Events? It would include competition news and publications (i.e. new issues of SPAG). Of course, with this format, we'd probably want to skip dates of every new game that is released. For games, it seems to me that having a live feed of recently-listed games on IFDB might be more efficient. 5: XYZZY Awards 2014 finalists announced. 20: My Compy Valentine entries released. 25: XYZZY Awards 2014 second round votes due. 5: ShuffleComp: Disc 2 final drafts due. This page was last modified on 19 June 2017, at 19:47.